Bradley Park Apartments offers 1, 2 & 3 bedroom apartments. Please select a unit that you like, fill out your name, number, and email, and you will be redirected to our quick and convenient online application. Not seeing what you're looking for? Availability changes every day, if you tell us what your needs are we’ll call you when availability changes. All room dimensions are approximate and may vary by apartment. Explore 1, 2 & 3 bedroom layouts in 14 floor plans at Bradley Park Apartments in Puyallup, Washington. Opt for a roomy one bedroom measuring 676 or 775 square feet. For a two bedroom apartment, choose from three layouts with one bath starting at 914 square feet and extending to 1,093 square feet. Two bedrooms with two baths range from 1,005 to 1,257 square feet. Luxuriate in a three bedroom floor plan of 1,284, 1,297, or 1,346 square feet. However much space you need, you and your pet will love your gated, non-smoking haven in East Puyallup. Our condominium-style property sits tucked away in a lush, beautiful landscape, yet is convenient to shopping and major highways. 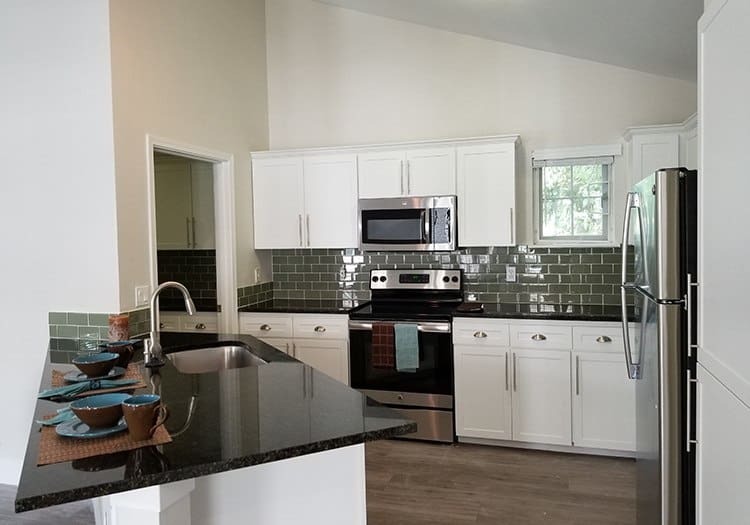 Modern apartment homes offer generous space and clean design, many with upgraded finishes including granite countertops, stainless-steel appliances, and easy-to-care-for, wood-style flooring. Whether you like to curl up in from of the fireplace on a cold night, or eat dinner out under the stars on your private patio, your Bradley Park Apartments apartment in Puyallup, WA, is your place to feel at home. Contact Bradley Park Apartments to learn more about policies and fees for pet-friendly apartments for rent near Tacoma, Washington.